In fact, customers were literally quaking in their shoes as they stood in line to buy a bowl of this heavenly soup, fearful they might somehow give offense to the store owner and become “excommunicated” from the list of people allowed to patronize the establishment. What is it about this concept that you can put to use in your public speaking business? How about the shocking assertion that that the customer is NOT always right and some should be jettisoned as soon as you find out they’re more trouble than they’re worth. The reality is that sometimes customers are not sane and should only be given the benefit of the doubt up to a certain point. There’s another saying in retail that goes something like this: “80 percent of your sales come from 20 percent of your customers, and 80 percent of your problems come from 20 percent of your customers.” What that tells us is that it is critical to your public speaking business to identify the 20 percent of troublemakers early on and cut their crap short. 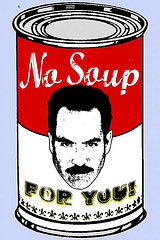 That’s what the Soup Nazi was dong with George. He had enough insight into human nature to determine that George was going to cause problems and a sale at ANY cost is not always a sale worth making. Sometimes it’s better to retain the power to say I choose not to sell to you. And don’t forget, there is also the school of thought that tells us scarcity creates desire, though you should should not interpret any of this to mean you should take any customer’s intent to give you money lightly. Just make sure it’s a win/win situation for both parties and don’t be afraid to drop the hammer if necessary.